It has been VERY rainy the last few days here. So, rainy that our pond is full, our neighbors’ yards are filled with water, and our driveway is incredibly soft. We are beginning to feel quite stuck in the muck with all the soggy clay around here. The continued rain led me to decide on umbrella themed lunches for this Thursday. 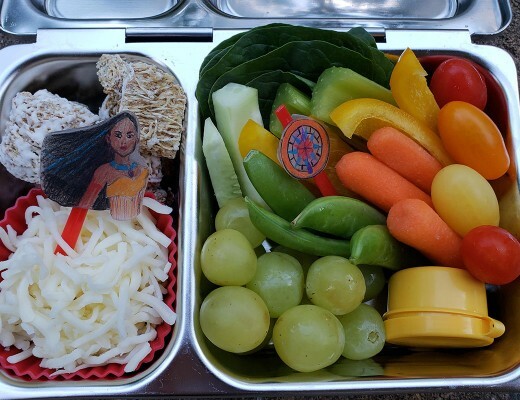 First, I’ll share my daughter’s lunch. 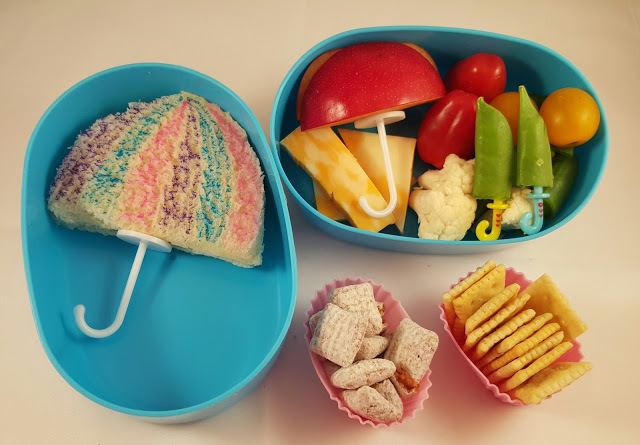 She has an umbrella shaped peanut butter sandwich colored with food safe markers in one tier of the blue bento box. The other tier holds slices of Colby cheese, tomatoes, and cauliflower along with chunks of plum cut and arranged on an pick to resemble an umbrella. Halves of sugar snap peas are also on umbrella picks. 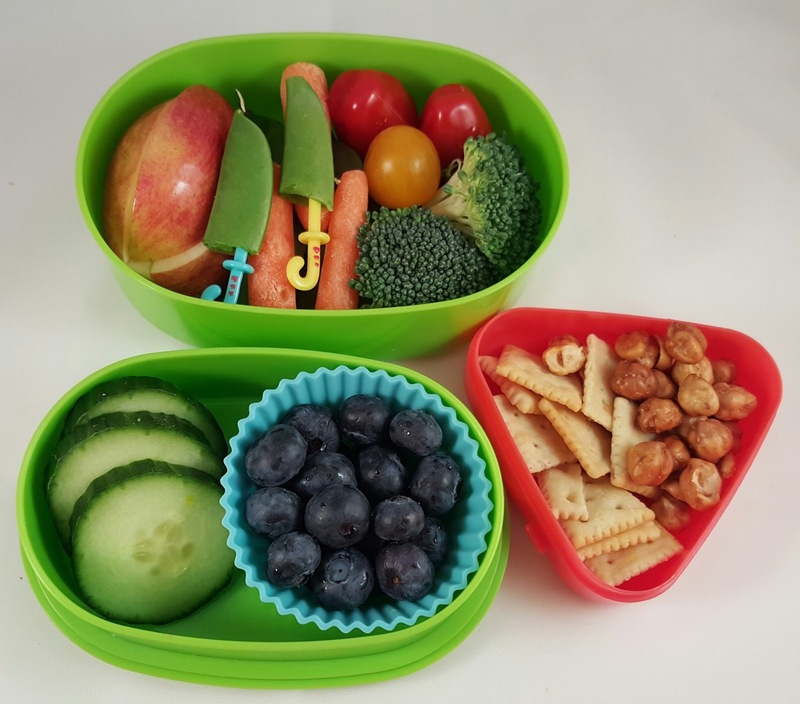 In the smaller silicone cups, she has a few mini saltine crackers and a few pieces of muddy buddies. I saved the white umbrella handles from chocolates we had a few years ago. I also have green handles saved from Lindt chocolate carrots that I have used in bentos for umbrellas before. 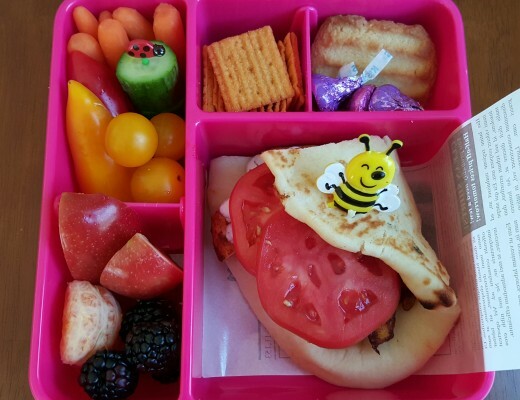 Since Icolored the sandwich in pink, purple, and blue stripes, I decided to mix and match my bento box tops and bottoms to coordinate. 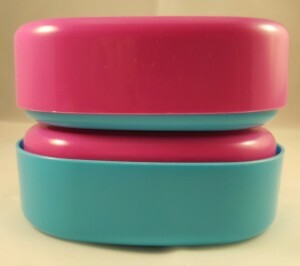 This also allowed me to use two bigger sections as bottoms so that one was large enough to fit the sandwich and umbrella handle while still having a deep enough box to fit the umbrella made from plum pieces. I think the pink and blue combination will brighten my daughter’s day tomorrow even if the rain continues. My son doesn’t eat sandwiches so his version of the umbrella lunch is much more simple. He has slices of apple, carrots, tomatoes, broccoli, cucumber slices, a cup of blueberries, and some sugar snap peas. A couple of the sugar snap peas are cut and added to umbrella handle picks to look like umbrellas like I did in his sister’s lunch. In the small red box, he has a few mini crackers and a few roasted chick peas. I will also include a tube of yogurt in his lunch. 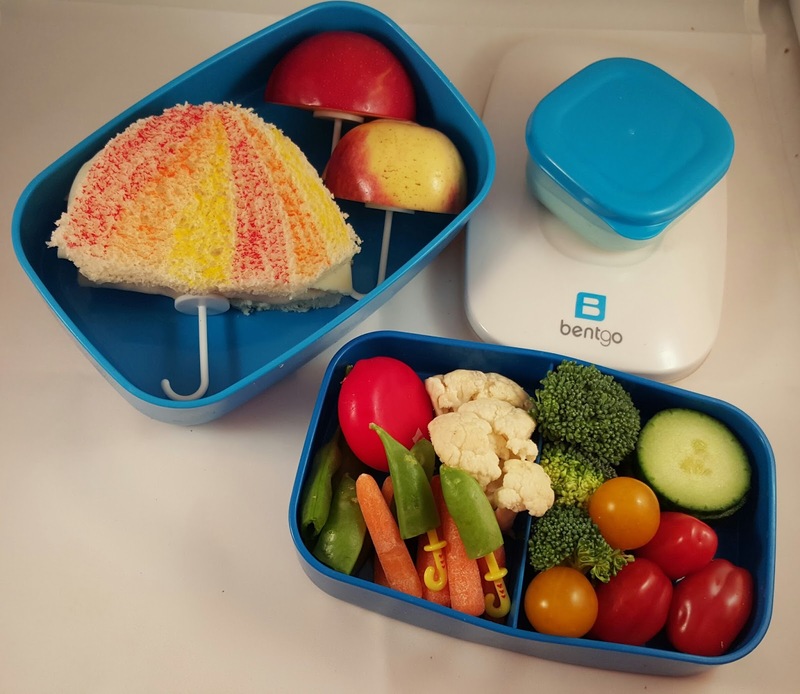 I packed my husband’s lunch in our Bentgo box. He has a turkey and provolone sandwich cut and colored to look like an umbrella. To the side, he has two more “umbrellas” made out of plum and apple. These were very easy to make. I just cut the side off of the apple or plum, cut the side in half, arranged the two pieces back to back so that the skin was to the outside, and stuck a piece of toothpick through the back to hold them together above the white handles. 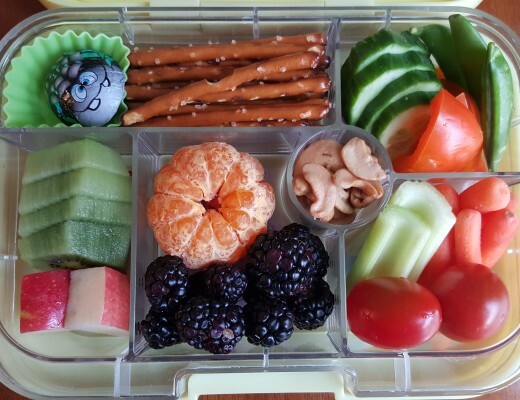 The other tier of my husband’s lunch contains veggies, and a Babybel cheese. The small square container holds homemade Ranch dip to go with the veggies. 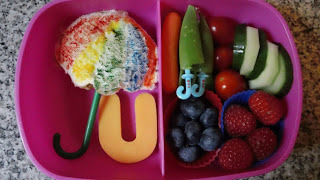 While you are visiting my blog, you can click over to see another umbrella lunch I packed a few years ago when my daughter was in kindergarten and her class was covering the letter U. I posted my U is for Umbrella lunch along with other lunches for Q, R, S, and T in this post.